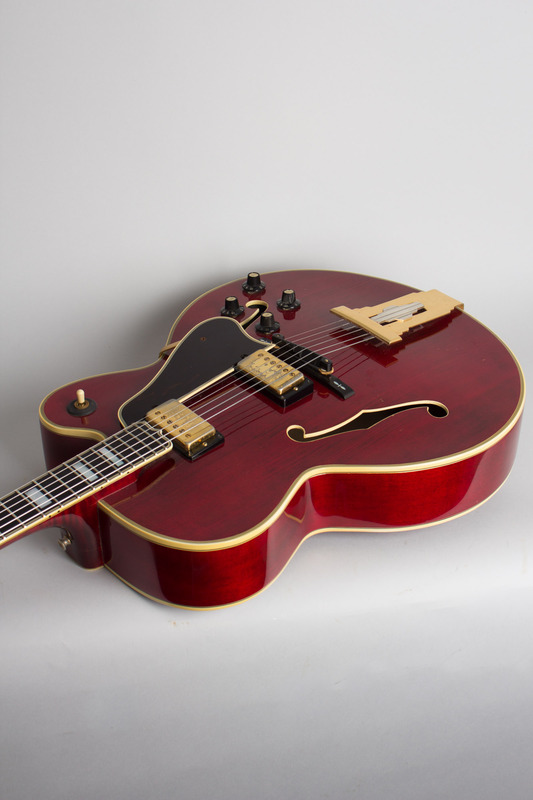 Gibson L-5CES Model Arch Top Hollow Body Electric Guitar (1976), made in Kalamazoo, Michigan, serial # 00204745, cherry lacquer finish, maple back and sides, spruce top; laminated maple neck with ebony fingerboard, original black tolex hard shell case. 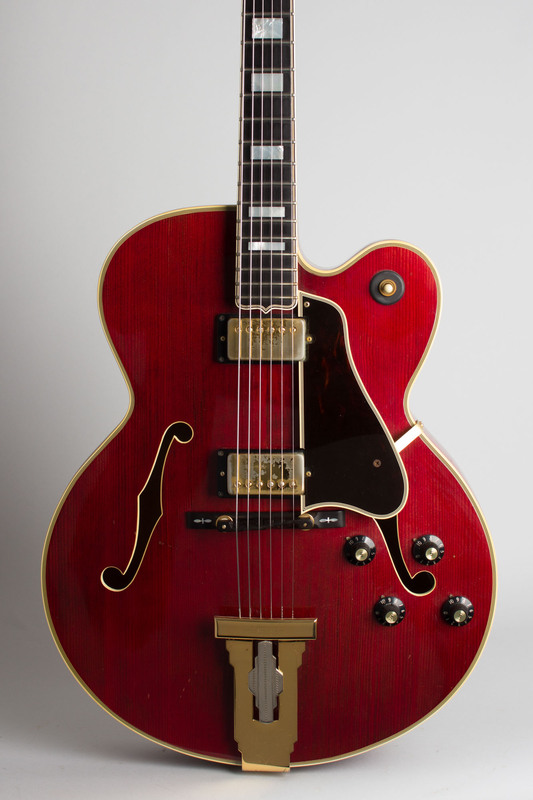 This rich, deep cherry beauty is striking 1970's example of one of Gibson's all-time finest guitars: the L-5CES. Even in this Norlin-controlled era of Gibson history, these top-line carved guitars were built by the finest and most experienced craftsmen at the Kalamazoo factory and maintain an aura of quality lacking in many period Gibson products. This guitar is a truly deluxe acoustic-electric with a fully carved solid spruce top and maple back, multi-binding on all edges and lavishly gold-plated metal parts. 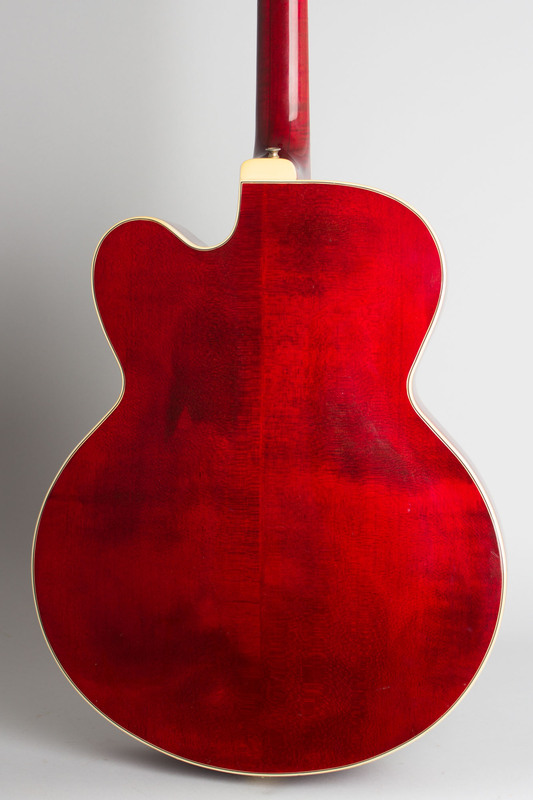 The neck profile is wider at the nut than the dreaded late-60's skinny neck, and has a rather shallow flat profile similar to the 1960-62 era examples. 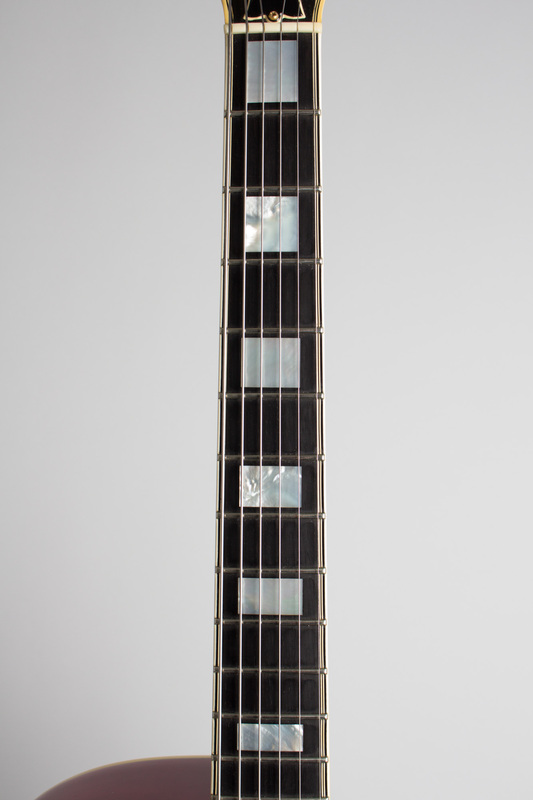 The hardware and appointments the same as this model adopted in the late '50's: two gold-plated humbucking pickups, a 3-way switch and volume and tone controls for each. These are capped with the "witch hat" knobs introduced in 1967. 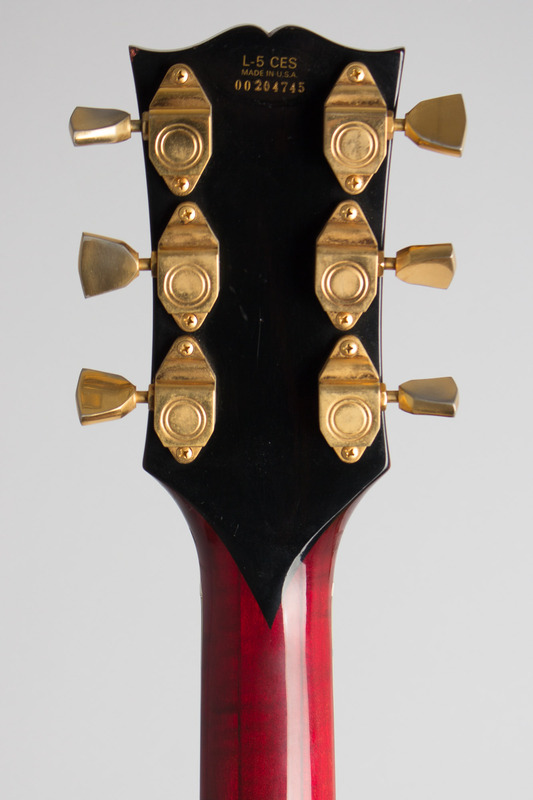 The gold-plated tuners are heavy individual Kluson Sealfasts and the tailpiece is the heavy engraved "L-5" unit with a silver-plated insert, both designs dating back to the 1940's. 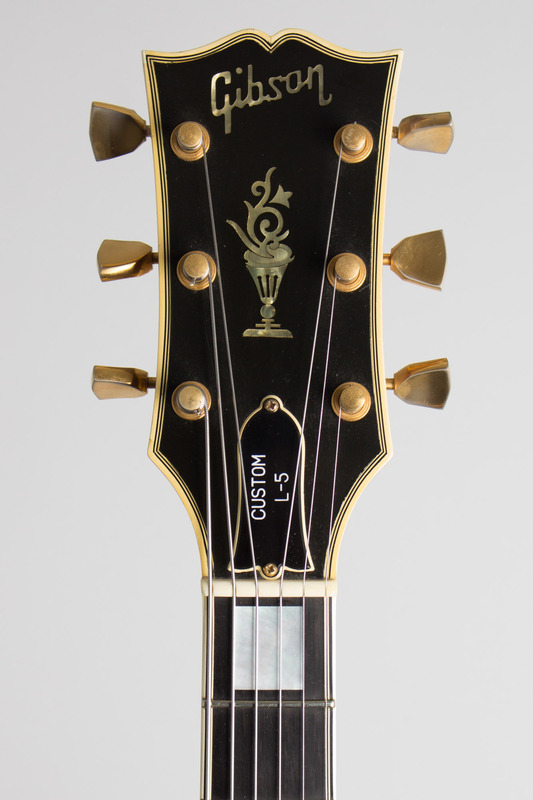 The multi-bound headstock carries the pearl Gibson logo over the "flowerpot" design inlay, a trademark of the L-5 since 1923. This guitar was made in 1976, one of only 139 built that year-for comparison Les Pauls were issued by the thousands at that time-even the very expensive Custom shipped over 4000 units. It carries the short-lived serial number decal on the back of the headstock that Gibson used for less than three years. This involved separate decal for each model but a continuous single serial number series running across all. It must have been a nightmare to keep track of at the factory-not to mention easily removed if the instrument was stolen! Gibson abandoned the idea and replaced it after less than three years with the stamped date encoded numbers still in use today. Even in Gibson's less classic times these L-5s were always a flagship for the company made with the greatest care and pride. This is a superb playing and sounding guitar, an enduring example of Kalamazoo's finest craftsmanship. Overall length is 42 1/4 in. (107.3 cm. ), 16 7/8 in. (42.9 cm.) wide at lower bout, and 3 1/4 in. (8.3 cm.) in depth, measured at side of rim. Scale length is 25 1/2 in. (648 mm.). Width of nut is 1 3/4 in. (44 mm.). 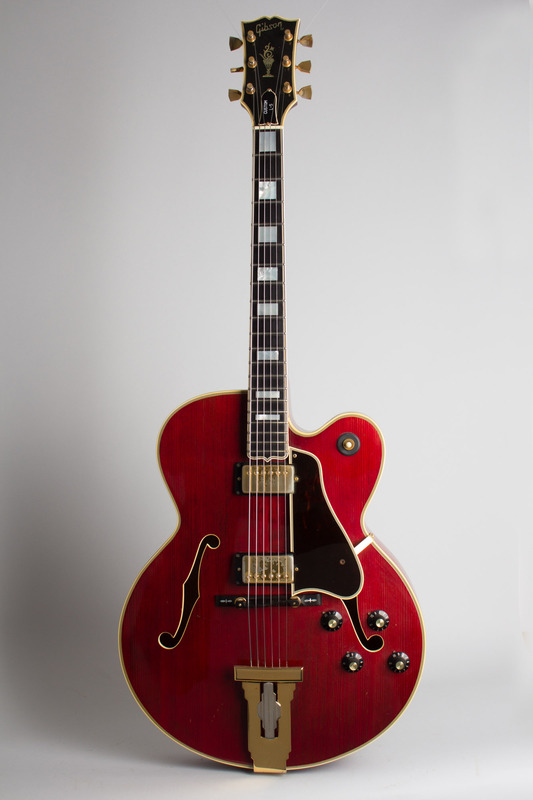 This is an all-original and very clean guitar, with some light wear but no damage or repairs. The only notable alteration is a strap button added at the heel, once on the treble side now on the center. The pickguard may be an exact repro; if so it's so close it's hard to tell! 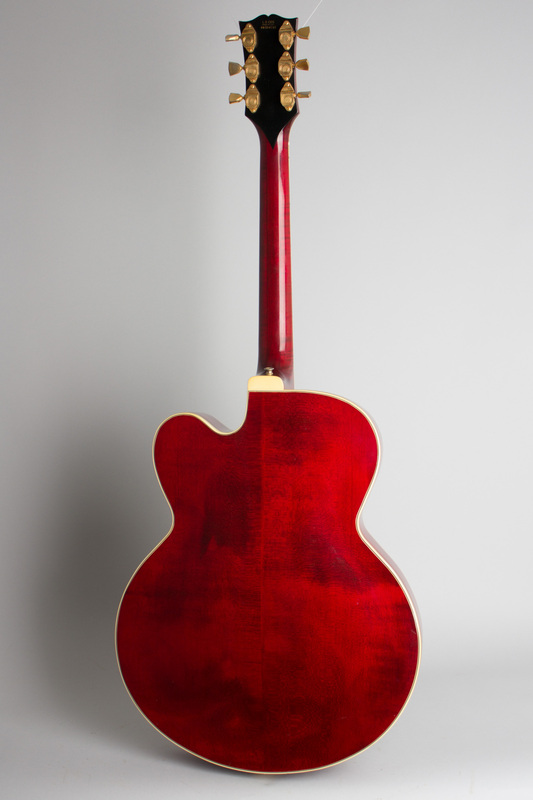 There are some small dings to the top, a few by the tailpiece and more near bass side F-hole; other than these the finish is extremely clean overall and retains a rich cherry color with no fade. There is some light wear to the gold plating overall, the only heavy loss is to the lacquered gold on the pickup covers. This guitar does not show very much play time and is a wonderful instrument, a great sounding reminder of how even in their least-well regarded era Gibson could turn out extremely fine instruments. Excellent Condition.